This is the Tinderbox map of Hypertext #59 The Library. What I’m planning here is a sort of IF influence on the piece by incorporating a quest, or task, separating the library into rooms, and providing clues within the stories that will lead to a successful ending. Not all that easy. If I’m writing for the IF value, I find myself sacrificing story through the language as there are instructions and descriptions to be given to the reader. If I concentrate on the story, I lose the thread that must run through to allow the reader full access to paths leading to the ultimate ending while making sure all necessary information or clues are given and accessible via several choices of path. But here’s the fun part: I’ve discovered the key to the puzzle is language-based and while I need to figure out how the clues can be ‘taken’ as ‘inventory’ as in IF so that they will all be available no matter how or in what order they are collected. The neat part is how the puzzle, the clues, and the solving all came in a pattern that I have to work to coordinate while making the story entertaining. Even as I settle myself in for a nice hypertext write, I wonder where it all is going. Even I still have some dislikes of the medium in the reading of it, but then, there’ve been quite a few changes incorporated into hypertext work now. Even as I write in it I need these ‘changes’ to keep the groove, namely, to see the visual presentation and that for me usually means some color if not graphics. This is also likely why I’ve still not bothered to master interactive fiction, as in the old text-interplay of Photopia, et al. It’s not visually exciting. Particularly when seeing “There’s no such thing” a few zillion times (I happen to be certified directionally dysfunctional). When I first got into IF and then hypertext via Storyspace, my mind zoomed ahead to a combination of the two–never the concept of IF alone–and with images and sound as well. Now I’m not quite a senior citizen but I’ve been raised in the era of television at least, so I’m used to the visual saturation of the senses–though books were still a big, big part of my list to Santa. It makes one wonder how the younger generations, brought up on laptops rather than mere laps in a rocking chair, feel about these forms of story when they can get film clips on their phones for goodness’ sake. 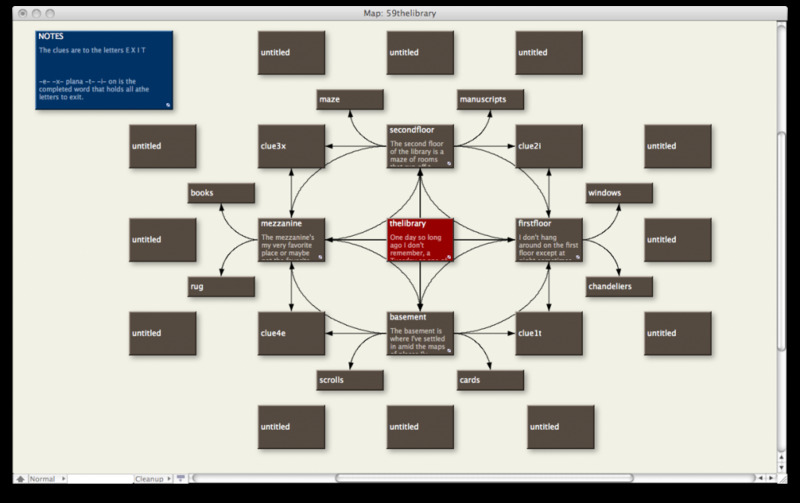 A couple of years ago I played around a bit with Chris Crawford’s Storytron, in beta form, more on the authoring side of things than on the reading and playing of the prepared story. At that time, unless my mind is deceiving me, there was a very promising graphical interface that was highly sophisticated to go along with the program. When I checked out Storytron in the last couple of days after its launch of a fully useable program, I was surprised to see the same old Sponge Bob Square Pants figures (faces?) in the play areas. While Storytron is sort of halfway between IF in its decisions and hypertext in its manual use of clicking menus, it doesn’t do much in the way of eye-appeal. Same thing with the promise of Facade, which hasn’t progressed any from its intial output and primitive visuals. Why are some of these great concepts not really accepted by a much wider audience? Somehow I believe it has something to do with needing to look as exciting and interesting as the content should certainly be. Like I said, I may often opt for the classics in their physical text and creamy-paged form and a quiet corner with a soft-cushioned curl-up-type chair, but I still have come to expect some visual stimulation when it’s just my Mac and me. In this hungry-eyed era I would think that aside from story and good solid writing another major consideration needs to be presentation. I’ve been checking my stats lately because of the changeover from Typepad to WordPress to see if and why Google searches still point to–and find!–old deleted posts on the Typepad versions of the weblogs. This search caught my eye: “interactive fiction versus storytron which is better.” Undoubtedly, it led the searcher to one of my many posts on either subject and left them there since further links from that web page were supposedly blocked (the files were actually all dumped, but the ghosts of posts still linger in the atmosphere), and since there’s no reasonable way of redirecting from Typepad to the WordPress mirror. The particular search above gives me the willies; it would seem that the difference is obvious to anyone knowing anything about either project. While in many vague ways Storytron can be connected to IF in the meaning of “interactive,” they are really two separate animals when you consider that IF is largely felt to reference text-based adventure. Chris Crawford didn’t put ten years of his life into Storytron to merely come up with something “better” than interactive fiction. It also seems that a quick visit to the sites–that of Storytron and the many on IF–would reveal immediately that there’s apples and oranges here. I suppose what bothers me most is not the question, but that an answer would not have been found before following the search that led someone to my site. And then, to be dropped off into the netherworld of impossible redirection because of Typepad’s stubborn manipulation. I wish I had had the foresight and the time to go through all 5500 entries (Spinning and Hypercompendia) to add a forwarding link on each post; I just never thought the old ones would still be floating around out there. INTERACTIVE FICTION: Now’s the Time! 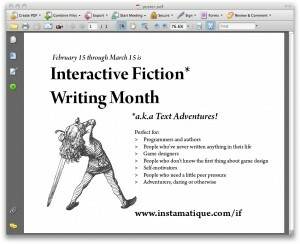 Thanks to Dennis Jerz for pointing out Interactive Fiction Month which in true new media style, runs mid-February through mid-March. There’s more information at this site as to how to participate, and it appears to be both a stimulus package for beginners as well as an opportunity for the more knowledgeable to get into it.